It is now two months since umpire Dale Scott suffered a game-ending foul ball head injury in Toronto, and he has not returned to the Major League field since. With no further status update from the League, we continue to wish him the best. His presence on the field is truly missed. Dale Scott has not umpired since April 14. At this time, the UEFL is invoking League Rules 1-2-b and 1-5-a for any team owner who has drafted Dale Scott and wishes to replace him on their crew. The membership voted during last year's Rules Summit to allow owners to replace an umpire who becomes injured or bereaved during the season. This is the first implementation of that rule. Because Scott is a crew chief, two separate injury clauses have been invoked: one for Crew Chiefs and one for Crew Chiefs/Primary/Secondary umpires. As mentioned in last month's A Look at the Dale Scott Crew Without Their Crew Chief, Scott's regular season crew consists of Jim Reynolds, Brian Knight, and Lance Barrett. 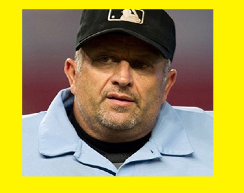 Reynolds, as the number two umpire on the crew, has served as acting crew chief in Scott's absence and has remained the senior-most umpire on the unit, with limited exception (e.g., Joe West joined the crew from May 16-21 to replace Brian Knight). Meanwhile, Triple-A call-up umpire Stu Scheurwater has remained with Scott/Reynolds' crew ever since the day after West returned to captain his own crew on May 22. If you own Scott in any capacity (Crew Chief, Primary, or Secondary), and you wish to make a replacement, pursuant to UEFL Rule 1-5-a, you may select any umpire who has fewer points than Scott for that classification. Scott has two points in Primary and Secondary classifications, and -2 points in Crew Division. Reynolds has 10 points in Crew Division. Pursuant to UEFL Rule 1-2-b, if you drafted Scott as your Crew Chief, you may replace him with Reynolds. If you wish to replace Crew Chief Scott with a Crew Chief other than Reynolds—or wish to replace Primary/Secondary Umpire Scott with any other umpire (other than those you already own)—you may do so, provided this alternate replacement has fewer than -2 points in Crew Division, or +2 points as a Primary/Secondary Umpire, as applicable. UEFL Rule 1-2-b: "In the event of injury to the designated crew chief, wherein the chief is officially placed on the Disabled List or on Bereavement, the replacement umpire shall be whoever is appointed by MLB to replace the injured umpire as crew chief or acting crew chief of his MLB crew. This announcement must be public and requested by the affected UEFL member(s) to take effect." UEFL Rule 1-5-a: "...If a significant personnel modification (hiring, firing, release or retirement, except as exempted by Rule 1-4-d) occurs after the pre-season, no UEFL roster may be modified, unless such modification would result in the requesting member losing points in the UEFL Standings as the replacement umpire’s score fully (and retroactively) replaces the injured/fired/etc. umpire’s score..."